Many of today’s cars and light trucks employ the use of all wheel drive or four wheel drive. While each manufacturer may have a different system for providing power to all four wheels, they all use some sort of differential or transfer case to get the power from front to rear and left to right. Some common symptoms of four wheel drive failure include: illuminated dash indicators, failure to lock the front and rear together, shaking and vibration or ominous sounding noises when engaged. If you think you have a problem with your four wheel or all wheel drive system, trust the experts at Big Sky Tire Pros to quickly and accurately diagnose and repair the problem. 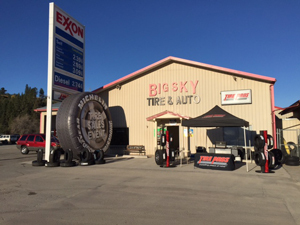 Big Sky Tire Pros is a leader in offering name brand tires, wheels, auto repair and brake services. Our well-trained staff specializes in the sale and installation of all tires, including passenger car, performance, light truck or SUV tires. Are you ready for a fresh new look for your vehicle? Custom wheels and rims are also available at Big Sky Tire Pros. We also offer complete under-car services, such as oil changes, brakes, shocks, struts, alignment, and transmission service. Big Sky Tire Pros provides these services for both foreign and domestic vehicles, and offer them at competitive prices. Please Browse through our website or Call Us at (406)297-2623. Big Sky Tire Pros offers name brand tires at affordable prices for your car. We offer brands such as Michelin, BFGoodrich, Continental, Bridgestone, Hercules, General, Firestone and many others. Big Sky Tire Pros also specializes in a full line of services for your automobile, such as brakes, alignments, oil changes, tune ups and much, much more. Please give us a Call Today or Click Here to schedule an appointment.